Imagine a world where clothing feels like sandpaper, light is excruciating, or sounds make you feel like your ears are going to bleed. That is what it’s like for someone with sensory processing disorder, or SPD. Approximately 1 in 6 children have SPD (some reports say 1 in 20, but this appears to be based on earlier research). It is unclear how many adults are affected; it is typically seen in children with autism and ADHD. There is very little research on adults with these issues at this time. There are not many treatments for SPD or ways for people with it to get relief. Cutting tags out of clothing and laundering it multiple times before wearing (so it is soft) can help with tactile issues. Precision tinted lenses can help with photophobia, and ear plugs can help with auditory issues. However, chiropractic has been found to help. SPD is a neurodevelopmental disorder that occurs because the brain is unable to process and integrate common sensory information that is received from one or several of the five senses (taste, touch, smell, vision, sound) as well as two other senses, the proprioceptive system and vestibular systems. The proprioceptive system extends throughout the spine and joints. When there is a problem with this system, it can cause problems with motor skills, learning, behavior, and emotional and social development. The vestibular system is located in the cerebellum (base of the brain), the cervical spine, and inner ear. It regulates all sensory information that the body takes in and of the sensory systems in the body, is the most important. The result is an inability to tolerate certain types of stimulation including being touched, eating certain foods, and hearing certain noises. It can also affect other seemingly unrelated issues like sleep problems, uncoordinated or clumsy, balance issues, and difficulty writing or reading in cursive. This can make life very difficult because the individual essentially lives in a world that they were not built to tolerate. They may feel depressed, anxious, frustrated, or afraid as a result. Parents may feel helpless because they don’t know how to help their child cope in a world that often feels scary and painful. There are several ways that treatment for SPD is approached. One very effective treatment is chiropractic for SPD. Another popular treatment for SPD is therapy. Children work with a specially trained, licensed therapist in a sensory gym. The goal is to help them better adapt to their environment. Diet is an important aspect of SPD treatment, particularly gut health. A clean diet (no processed foods, all natural and organic) is a very good start. Some doctors recommend a gluten free diet. Whatever the case, it must be well balanced and provide the necessary vitamins and minerals needed for good health. Magnesium and Omega 3 fatty acid supplements may also be advised. This works very well with chiropractic as it also addresses the root of the problem. 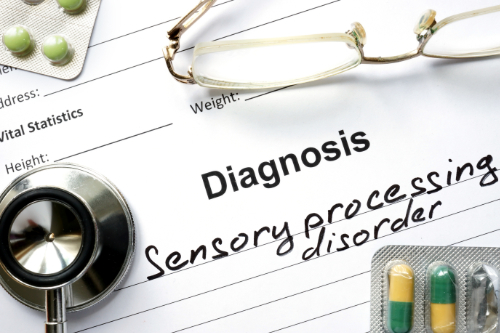 How does Chiropractic Help Sensory Processing Disorder? It is the primary role of the spine to protect and contain the fragile nervous system. The nervous system is what controls how we process our environment. Its function is to respond and adapt to the internal and external environments. Structural shifts caused by injury, habits, even a forceps birth can affect the alignment of the spine. This creates neurological stress that hinders the processing and flow of information. By bringing the spine into alignment, chiropractic can help ease the neural stress, improve neural processing, and facilitate better flow of information and neural firing. This, in turn, helps to alleviate the symptoms of sensory processing disorder.